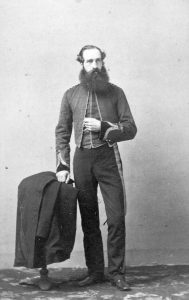 Philip Jackman sailed with the third and main body of the detachment that crossed the Atlantic Ocean and went around Cape Horn on the clipper ship called the Thames City. The ship departed from Gravesend on October 10, 1858 with Captain Luard, Lieutenants Lempriere, Palmer, Surgeon J.V. Seddall, 118 non-commissioned officers and sappers, 31 women, and 34 children on board. Life on the Thames City was very cramped and privacy would have been very limited as the passengers slept in close bunk-like quarters. They were given a collection of 2,000 books handpicked by Bulwer-Lytton to provide entertainment and intellectual stimulus for the long journey. The ship made only two stops to pick up provisions; the first in the Falkland Islands and the second in Chile. A total of eight children were born and one woman and one child died during the voyage that spanned 19,000 miles over 206 days, reaching Esquimalt on April 12, 1859. 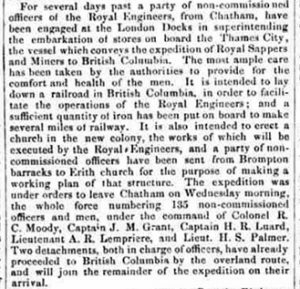 The preceding two ships carried surveyors and carpenters who sailed to Panama, crossed the land by train, and boarded other vessel that sailed the Pacific to Esquimalt. 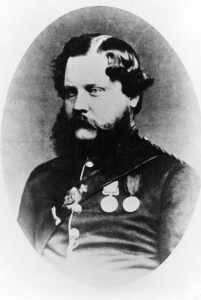 The first group of Royal Engineers arrived in time to witness Governor James Douglas read the proclamation that created the mainland colony of British Columbia at Fort Langley on November 19, 1858. The fourth group consisted of a handful of married Sappers and their families on the Euphrates.